Green tea is a refreshing, mildly stimulating beverage with less caffeine than coffee or black tea and a high concentration of antioxidants that protect cells from free radical damage. 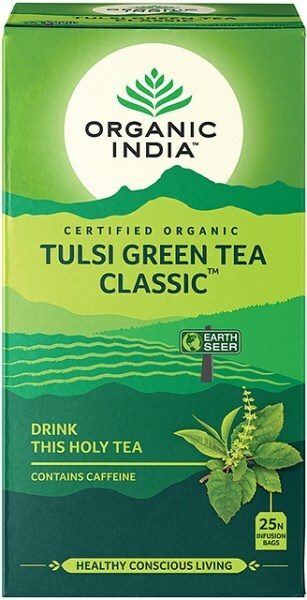 In Organic India Tulsi Green Tea, its astringent vegetal flavour blends beautifully with three types of tulsi – lemony vana, aromatic krishna and calming rama. 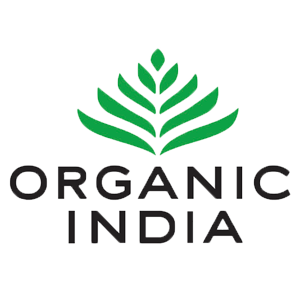 Tulsi or holy basil (Ocimum sanctum) is an Indian herb prescribed in Ayurveda to help the body detoxify, regain equilibrium, and respond to stress in healthy ways. It is also thought to enhance energy, endurance and immunity. Now recognised as an adaptogen, tulsi is an excellent natural restorative for emotional balance and physical wellbeing.